It's ugly, but most CG shows are. It may still attain greatness. ETA: I mean, is there anyone in the history of Star Wars with a track record as consistent as Dave Filoni? Nope, I have faith in him to make something interesting. He's not as involved in the day to day of this series, he's said that he only gives his notes and thoughts to the showrunners. He's still involved, just in a hands off capacity. Extended sneak peak, including General Leia and Captain Phasma. That humanoid droid is kinda unsettling. Very colorful. I don't care much about the premise of a spy. The racing is kind of interesting, but the characters don't come off as appealing in the video. The animation style is not my favorite, the whole CGI echoing cell-shaded thing just feels very awkward and more forced than either traditional or straight CGI would have. Not enough to keep me from watching, but not my favorite. THAT said I like pretty much everything else in that trailer a lot. Characters, setting, situation, ships et all look like a lot of fun. Can't wait to watch. -ZacWilliam, am I right that besides Phasma we also see a Gold Stormtrooper and a Red Tie pilot in there? Apparently Phasma was a Power Ranger this whole time. The character animation is simply terrible, they should of stuck with the CGI from Clone Wars and Rebels, the vehicle animation look a lot better, clearly whoever working on this has read the scripts and thinks its horrible and said, we'll give the main attention to the vehicles than the characters! 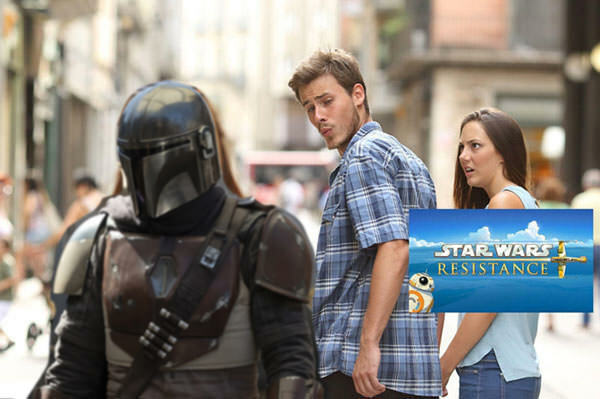 I also think the show title is misleading, it shouldn't be called Resistance, they should of called it Star Wars Racers or Galatic Racers, in all, I'm not very impressed with this, I don't expect it to last more than two seasons, hell it might last one depending on whoever in charge of Lucasfilm as Lucasfilm going through changes in regards to whoever in charge if rumors are to believed! A voice actress who plays Princess Leia in a new Disney cartoon took to Twitter to openly mock Christine Blasey Ford, who has credibly accused Supreme Court nominee Brett Kavanaugh of sexual assault. In a since-deleted tweet, Rachel Butera posted a video of herself mimicking Blasey’s voice. Head's up you can get the entire upcoming Season on Amazon right now for $2.99 for the whole thing. That's right, not per episode, for the entire season. Animation is absolutely fine in practice and the colors and world design are frequently gorgeous. The setting, ships, secondary and background characters and the world building are the real stars here. All of that is absolutely wonderfully done. There's loads of great characters, unique droids and aliens and stuff that's intreaguing and cool everywhere. The biggest downside so far is Kaz himself. He's not unlikeable really. In the oversized pilot ep his ending up in way over his head seems rather endearing and not really his fault at all. There was an innocence to his messing up that was ok, but by the third episode he was messing up pretty constantly in a way that WAS entirely his fault and arrogantly stupid to an extent that made early Ezra seem competent and reliable. I don't particularly love that trajectory and I hope the third ep turns out to be an anomaly or his character starts growing a bit faster on his intended arc. Still I enjoyed it as a whole, there's a ton of potential and a GREAT setting, and I look forward to more eps. -ZacWilliam, it's really great to get more development of the FA era and Poe and that world and all too. A TV show like this is really gonna open the new SW era up in a big way. Edited by ZacWilliam1, 09 October 2018 - 02:15 AM. I watched the double sized pilot and the 2nd (or is it 3rd?) episode. Liked it for the most part. 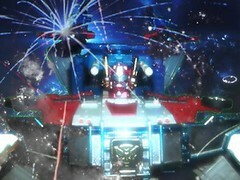 The animation is nicer than I first thought and the colors are bright. Fell fast asleep during the 2nd episode, so I'm going to have to rewatch it. I will echo the sentiment that Kaz is a little much at times (and so obvious as far as "Hey kids! I'm the kid friendly male hero of this show!" type of character). Wow. I was really surprised by this show. 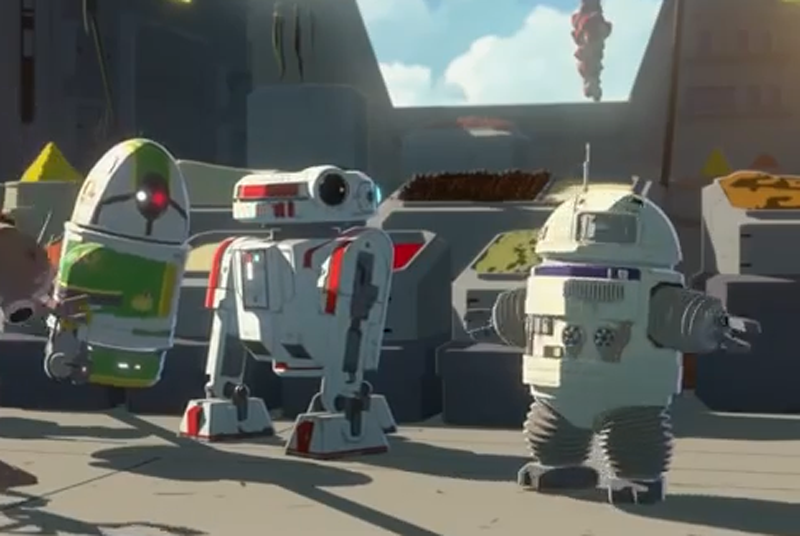 I was all ready to hate on the animation style and colors, and then they created a station populated by one of the most diverse Star Wars casts I can remember. There's some deep dives into aliens of Star Wars. I'm pretty sure Jim Rash's character is based off of an early sketch of Ewoks. The storyline is a bit straight forward right now, but if this follows the same path that Clone Wars and Rebels did as the show and character evolve we'll get darker and more serious storyline. Color me impressed. PS - My five year old - who's watched all the movies and shows - loved it too. Saw the first few episodes, wasn't really impressed -- but didn't exactly expect to be. Both because it usually takes a while for new show to grow on me, and because the whole post-RotJ world is, well.... not appealing. Really loving this series so far! The way the plot is unfolding is really well done, and Collossus Station is a really cool place with a hugely diverse cast of characters in-universe. I'm not so onboard with this so far. While I do enjoy the variety of beings on Colossus station, So far the show is just Kaz the doofus getting himself into trouble with little meaning to any overall connection to the sequel trilogy. We've had two Kids run from the first order after Kylo destroyed their village and the rest has just been Kaz being dumb.With him being a pilot I was hoping for some more ship combat or such, which might be coming the next episode but right now it's nowhere near as attention grabbing as Clone Wars or Rebels. Also in a video SW posted on youtube it's stated the series takes place 6 months before The Force Awakens. So far I enjoy the setting and the secondary and background characters, and I've enjoyed the episodes enough to happily keep watching but yeah, Kaz is the show's biggest week spot. He's just TOO much of a goof/screw up all the time with not enough other angles and sides to him to balance that out. And since the show is apparently not going to be an ensemble like Rebels, none of the other characters have been foregrounded enough to compensate for Kaz's less interesting/fun "slow start." I heard folks report that his character concept was explained as "A Bird. Awkward, hoppy and clumsy on the ground, natural and masterful in the air." If that's true their big mistake has been grounding him for THIS many episodes right at the start. It was pushed as a show about pilots, but up to this point has actually been a show about someone whose terrible at pretending to be a mechanic. All that said I think the last two eps definitely each improved on the one before. I'm still watching and I think there's a good chance the show will improve more and more as it goes on, it's just a slower and weaker start than I would have prefered. -ZacWilliam, at least the next ep seems to finally have Kaz flying a little again with Poe. 6 months before TFA is also six months before TLJ; I'm guessing that season 2 (which will probably hit screens while Episode 9 is in theatres) will show what's happening on Colossus while the First Order is making its move. Finally got around to checking this out the other day. It really didn't click with me. I like the look of the show and all but everything else felt like watching a bad 4Kids dub. The voice acting was hammy and deliberately cartoony sounding (Even Oscar Isaac as Poe sounded off). The writing wasn't helping this either. On top of that the background music was distractingly bad. There wasn't music so much as instruments reacting to what was going on on the screen (again like a 4Kids dub). All in all it felt way too juvenile and when my brothers interrupted me in the middle of an episode I wasnt too surprised to find I simply didn't care enough to return to it.